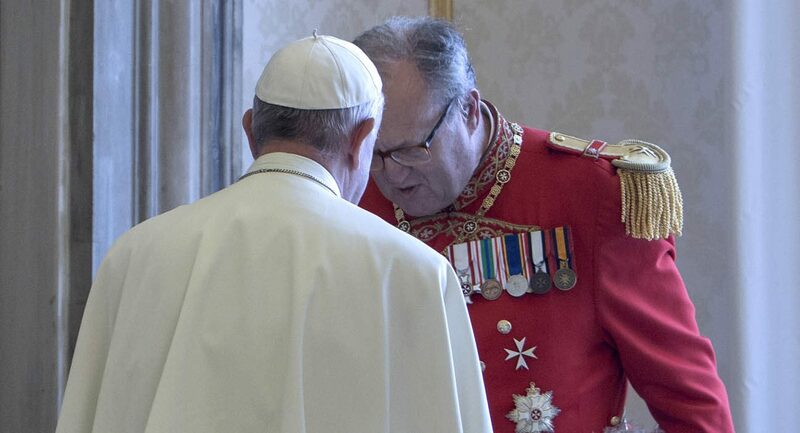 VATICAN CITY (CNS) — After weeks of very public tensions with the Vatican, the head of the Sovereign Military Order of Malta accepted Pope Francis’ request that he submit his resignation. The order’s communications office confirmed Jan. 25 that Fra Matthew Festing, the 67-year-old grand master, met with Pope Francis the day before and agreed to resign. The Vatican said Jan. 25 that Pope Francis intends to appoint a pontifical delegate to govern the order. Festing, who has led the world’s largest chivalric order since 2008, will submit his resignation Jan. 28 to the order’s governing council, according to the order’s communications office. The Order of Malta is made up of more than 13,500 knights and dames; about 50 of them are professed religious, having taken vows of poverty, chastity and obedience. The grand master is elected for life from among the professed knights. Festing’s offer to resign came after Pope Francis set up a commission to investigate Festing’s removal of the order’s grand chancellor, Albrecht Freiherr von Boeselager. A member of the commission told Catholic News Service Jan. 25 that Pope Francis received the commission report before meeting with Festing and asking for his resignation. In a statement in December, the order said Boeselager was removed “due to severe problems which occurred during Boeselager’s tenure as grand hospitaller of the Order of Malta and his subsequent concealment of these problems from the Grand Magistry.” It was widely reported the problems had to do with the distribution of contraceptives to prevent HIV/AIDS in health clinics run by or funded by Malteser International, the order’s humanitarian relief agency. Festing insisted the removal of Boeselager was an internal matter and, in letters leaked to the press, urged members not to cooperate with the Vatican commission. In response, the Vatican published a statement Jan. 17 praising “the commendable work that members and volunteers” with the Order of Malta carry out around the world and it urged members to cooperate with the commission for the good of the order and the church.